While Calico' Jack Rackham wasn't the most successful pirate compared to Henry Morgan and Bartholomew Roberts, he was instead remembered for employing the only two famous female pirates Mary Read and Anne Bonny in his crew. His pirate flag is also very famous as well. As legends go, in A General History of Pyrates (1724), Captain Charles Johnson spells the story of a daring ship theft by Rackham and his crew. 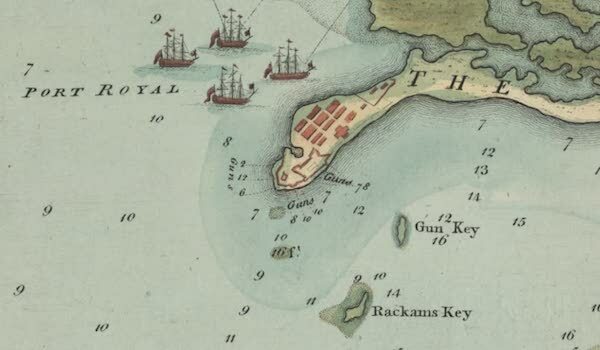 While Rackham and his crew were careening their vessel at a town in Cuba, a Spanish warship patrolling the coast entered the harbor along with a captured English ship. With no time to run the pirates were left surrounded in the port. The Spanish ship saw the pirates but could not get to them due to a low tide so they parked and waited for the morning. That night, Rackham and his crew took rowboats over to the English ship and took it over. When the dawn broke and the Spanish opened fire on the crew's old ship they simply sailed silently away in the new English sloop. 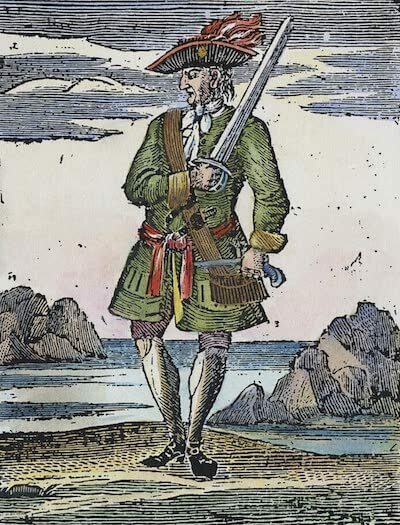 Jack Rackham, or Calico Jack was an English pirate born in 1682. The first record of his existence however was being the quartermaster on Charles Vane's sloop Ranger in 1718. While raiding ships outside of New York, Vane and the crew encountered a massive French warship which was nearly double the size of the Ranger. Vane claiming caution fled from the ship, however some of the crew including Rackham felt differently about this decision. Rackham suggested that they should have fought the warship because it would have had plenty of gold and treasure aboard, and also if the captured it they could replace their own ship with a much larger and well armed one. Of the ninety or so men aboard the Ranger, only fifteen agreed with Vane. However, despite having the majority Vane declared the captains decision is final and they fled from the French. On 24 November 1718 Rackham called a vote which ousted Vane from the captain's position and made Rackham the next captain. In an act of kindness, Rackham gave Vane and his fifteen supporters the other ship in the fleet along with some ammunition and goods to continue their piracy with. The day he became captain he sacked several small vessels, earning a solid reputation among his new pirate crew. In fact, most of Rackham's career was spent plundering easy, small vessels near the shore. One day in December he and his crew captured the Kingston a small vessel out of British Jamaica which carried a very rich cargo. He eventually made it his new flagship. However, he had taken this ship within sight of Port Royal and pirate hunters were sent after him. They eventually found him in February of 1719 while the ship was anchored at the Isla de los Pinos off of the coast of Cuba. Luckily for them, Rackham and his crew avoided capture by hiding in the woods because they were on land at the time, however the ship was taken back. Rackham is noted for flying the iconic jolly roger pirate flag that is popularized today with the skull and two crossed swords. He was also given the nickname 'Calico' for the expensive, flashy calico shirts that he would wear around. 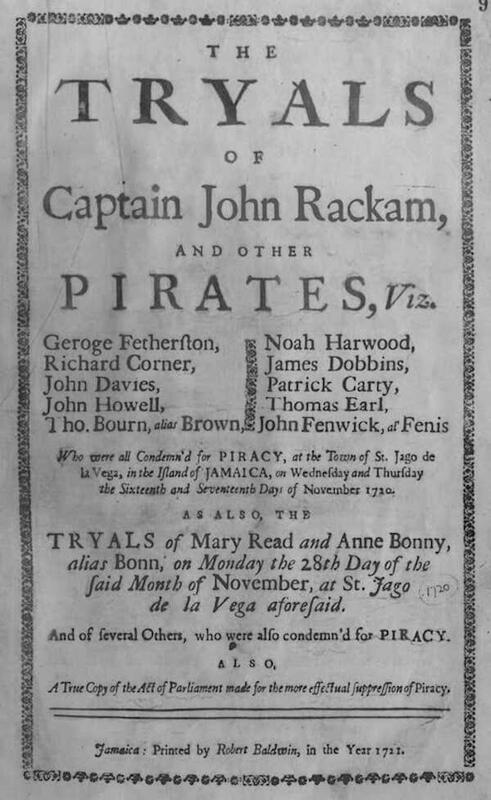 After the Jamaica incident, Jack Rackham and his crew sailed into Nassau in order to take the 1718 Kings Pardon that was being given by Governor Woodes Rogers. Rackham claimed that Vane had forced them to become pirates, and Rogers who hated Vane due to running his blockade a year earlier granted them their pardon and their freedom. However this life as an honest person was not to last. One time while drinking he began an affair with a young women named Anne Bonny, wife of sailor James Bonny who was employed by Woodes Rogers. After discovering the relationship, James ordered Anne whipped for adultery. Rackham offered to buy Anne's divorce, but she refused. With no other options, Rackham and Anne along with a new crew escaped to the high seas by stealing another sloop. When Rogers learned of Rackhams recent theft he sent two large ships with forty-five men in order to capture Rackham and bring him to trial. This action had voided Rackham's pardon and Bonny dressed like a man to avoid suspicion with the crew. This however, would not be the only women Jack Rackham would take aboard his ship. 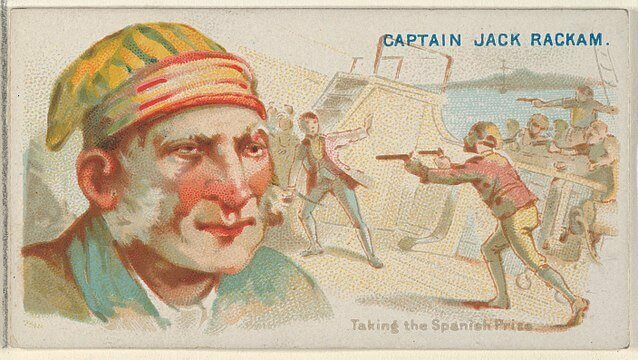 Calico Jack often invited conquered sailors to join his crew, and one day when the pirates were raiding a small vessel, most of the merchant crew had been killed and they had one of the men cornered. 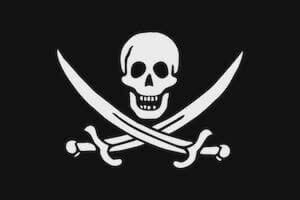 Instead of killing this man Calico Jack offered to let him join their crew. Anne Bonny befriended the man and ignited Rackham's jealousy. One day he confronted the "man" who in fact turned out to be a women, Mary Read in disguise as well. In October of 1720, Governor Woodes Rogers had issued a warrant declaring Rackham and his crew pirates, however pirate hunters were already after him at this time. When pirate hunter Captain Jonathan Barnet caught up with Rackham, they captured the entire crew easily in what became known as the Capture of the William. Most of the crew was drunk and passed out below deck at Dry Harbour in British Jamaica. 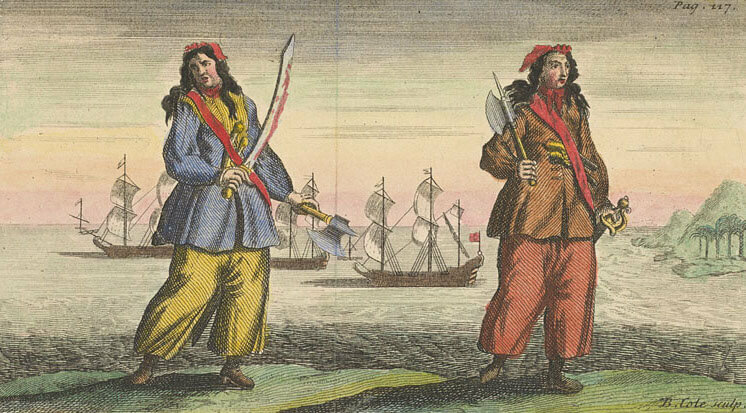 Despite all of the drunken pirates below, Anne Bonny and Mary Read fought on. Eventually the pirates were defeated, and 'Calico' Jack and eleven of his crew were sentenced to be hanged at Spanish Town, British Jamaica. Jack Rackham met his fate on 18 November in Port Royal, as he was hung and gibbeted on display at the main entrance to the city. This is now known as Rackham's Key. Mary Read and Anne Bonny who were both pregnant would escape by a technicality, with Read dying of a fever during childbirth in 1721. Anne Bonny would escape and never be heard from again, fueling even more to her legend as a successful female pirate.